We have very little solid information about Saint Mary, and both scholars and traditions differ on the interpretation of what we do know. She was a friend and follower of Jesus. Filled with sorrow over her sin, she anointed Christ, washed his feet with her hair. He exorcised seven demons from her. She was visited by the Risen Christ. There are also arguments about her life after the Crucifixion. The Greek Church maintains that she retired to Ephesus with the Blessed Virgin Mary and lived there the rest of her life. A French tradition says that Mary, Lazarus, and some companions came to Marseilles, France, evangelized and converted the whole Provence region, and then retired to live 30 years as a penitent hermitess at La Sainte-Baume. Oh, some things we do know for certain - Mary wasn't Jesus' wife or mistress, she wasn't the mother of His child, she didn't found a royal dynasty or separate branch of Christianity, et cetera, et cetera, ad nauseam. The only child of Aliprando and Adelazia, pious parents who were childless so long that they promised God they would devote any child of theirs to the Church. They kept their pledge, giving the boy a good education, and by age fifteen Gualtero was working as a Hospitaller friar in the San Raimondo il Palmerio hospital in Piacenza, Italy, beginning his lifelong devotion to care of the sick and poor. His father died not long after; his mother entered a convent, Gualtero sold off and gave away all their property, and the two devoted themselves to God. Gualtero worked in then San Bartolomeo hospital in Lodi, Italy, living as a sort of anchorite on the grounds. He founded clinics for the poor and pilgrims in the Italian cities of Fanzago, Vercelli, Tortona, Crema and Melegnano. With the financial assistance of the city of Lodi and the archbishop of Milan, Italy, he and a fellow priest founded the Ospitale della Misericordia (Hospital of Mercy) in Lodi, which attracted the services of many brothers, sisters and hermits, and the adjoining church of Saints James and Philip on 30 April 1206. Known for his ascetic life, working and travelling barefoot and dressed in sack cloth, he could heal by prayer and always gave away anything he had that was more than his immediate need. A deformed child, who died without baptism, was restored to life by Augustine's prayer long enough to be baptized. Augustine met a little boy who was crying because he had broken a jug of wine. Augustine gathered up the shards and put them back together again, and prayed over it; it refilled with wine. Through his intercession, a woman was delivered from possession of five devils. Augustine spent his final ten years in the monastery in Venice, Italy. Born to a poor Christian farm family, Anna's mother, a pious woman, died when the girl was five years old. In addition to her schooling, Anna had to help work the farm to support the family, but her teacher, Sister Lucy Wang, continued the religious education begun by Anna's mother. When she was 11, Anna's family tried to force her into an arranged marriage, but she fought against it. On 21 July 1900, an armed group associated with the anti–Christian, anti-Western Boxer Rebellion entered her village, burned the church, gathered all the Christians, and ordered them to renounce Christianity; many did, usually as a way to save their children, and Anna's step-mother encouraged her to do so. Anna refused, spending her remaining hours in prayer and encouraging others in their faith. Martyr. Fifth of eight children in her family. Nun, entering the monastery of the Hail Mary in Los Angeles, California in 1929, making her perpetual vows on 14 December 1933 and living a cloistered life. Founder of the Congregations of the Poor Clare Missionary Sisters of the Blessed Sacrament in August 1945 in Cuernavaca, Morelos, Mexico; it received papal approval in 1949 and 1951. Founder of the Missionaries of Christ for the Universal Church. By the time of her death she was over-seeing 36 missionary houses in 14 countries. Over 6,000 of her writings survive. Jewish layman who was attached to the biblical school of Tiberius, and served as assistant to the famous Rabbi Hillel. Secretly a Christian believer, Hillel was baptized on his death bed, and entrusted his holy books to Joseph. As head of the synagogue in Tarsus, his congregation caught Joseph reading the gospels; they beat him and threw him in the Cydnus River. He then publicly converted. Friend and counselor to emperor Constantine the Great, who appointed him to the high position of comes. Built churches in Galilee, Tiberias, Nazareth, Capernaum, Bethsan, and Diocaesarea, and evangelized throughout the Holy Land. Fought Arianism, and moved to Scytholopolis where he hid priests from their persecution. Financial patron of Saint Eusebius of Vercielli and Saint Epiphanius; Epiphanius wrote Joseph's biography. His guardianship of holy writings and holy men led to his association with guardians in general. Educated at the Royal College of Saint Alban at Valladolid, Spain, entering in 1649. Took the missionary oath on 16 October 1649 to return to England. Sent to Wales in 1654 to minister to covert Catholics, he lived his vocation while constantly on the run for 24 years. Arrested at Penllyne, Glamorganshire, 20 November 1678. Served time in the Cardiff jail with Saint Philip Evans. It took several months before the authorities could find anyone will to testify about the two, but they finally had a trial and condemned them on 5 May 1679 for the treason of Catholic priesthood. One of the Forty Martyrs of England and Wales. Member of the court of King Dagobert I. Married. Pilgrim to Rome, Italy, his wife became a nun and Wandrille became a monk at Montfaucon, Switzerland. Spiritual student of Saint Balderic. Hermit at Saint-Ursanne, Jura, France. Monk in Bobbio, Italy. 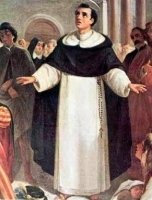 Priest, ordained by Saint Ouen of Rouen. Founded the Abbey of Fontenelle in Normandy, France in 657. Educated at the college of Saint Omer. Could play the harp, and played tennis. Joined the Jesuits on 7 September 1665. Ordained at Liege, Belgium. Sent to southern Wales in 1675 to minister to covert Catholics. Arrested at Christopher Turberville's house, Sker, Glamorganshire on 4 December 1678 during the increased persecutions following the Titus Oates Plot. When he refused to take the Oath of Supremacy he was imprisoned in Cardiff Castle; he served time with Saint John Lloyd. Condemned on 5 May 1679 in Cardiff for the crime of being a priest. Martyr. Nine year old boy in Machiazhuang, China. On 21 July 1900, an armed group associated with the anti–Christian, anti-Western Boxer Rebellion entered his village, burned the church, gathered all the Christians, and ordered them to renounce Christianity; many did, usually as a way to save their children who would have been killed, as well. Andreas refused. Martyr. Married and mother of two. On 21 July 1900, an armed group associated with the anti–Christian, anti-Western Boxer Rebellion entered her village, burned the church, gathered all the Christians, and ordered them to renounce Christianity; many did, usually as a way to save their children who would have been killed, as well. Lucia refused. Martyr. Married lay woman in the apostolic vicariate of Southeastern Zhili, China. Martyred in the Boxer Rebellion for openly declaring herself a Christian. 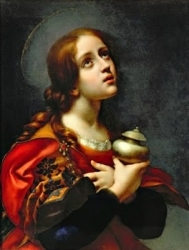 Mentioned by Saint Paul the Apostle in the Letter to the Philippians as having helped him spread the gospel, but no information about her has come down to us. Monk. Courtier to Emperor Henry III. Bishop of Osnabruck, Germany in 1068; he served for 20 years. Involved in the disputes between Emperor Henry IV and Pope Gregory VII. Founded Iburg Abbey in Bad Iburg, Germany. Eighth-century soldier, sailor and admiral of the Christian fleet stationed on Cyprus. Captured in battle by invading Muslims, he was imprisoned for four years, then ordered to renounce Christianity and convert to Islam; he refused. Martyr. Monk at Carméry in Auvergne, France. Restored the monastery of Ménat near Clermont, France. Spiritual student of Saint Patrick. Monk. Abbot of Inis-Coosery in County Down, Ireland. Retired to live as a prayerful hermit in Perthshire, Scotland. Monk in the Caucasus mountains. Spiritual student of Saint Maximus the Confessor. Imprisoned, tortured and martyred. Brother of Saint Antiochus of Sebaste. Martyr. Bishop of Pavia, Italy from 778 until his death. Commemorated in La Saussaye, Eure, France, but no details about him have survived. May have been a spiritual student of Saint Patrick. Priest. Missionary to Scotland where several churches are named for him. Bishop of Besançon, France. Much persecuted by the Arian Emperor Constantius. Born to the nobility. Ordained as a priest in 1344. Mercedarian friar. Ransomed 209 Christians who were enslaved by Moors in Granada, Spain. Seventh century monk. Founded the Abbey of Montfaucon in the diocese of Verdun, France. Fourth century nun in England. Martyred by invading pagan Saxons. Patriarch of Antioch in 280. Three Christians martyred together. We know nothing else about them but the names – Ajabosus, Andrew and Elian. A group of Christians martyred together in northern Africa. Saint Augustine of Hippo wrote about them.